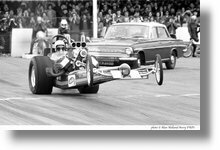 Many of you will have seen and enjoyed some of Alan Holland-Avery's photography in The Long Lost John Woolfe Racing Archives and The Dennis Priddle Collection elsewhere on this site. I am delighted to say that Alan has now committed further examples of his work to be displayed in a new collection under his own name. Where better to start Alan's collection than with his favourite shots. The pictures speak for themselves but note the time on Big Ben - 6:35 and that is a.m. - you have to get up early in the morning to get shots like this which were taken on a Sunday morning. 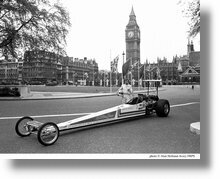 All I have to add is that in the right hand shot we have Don Beadle in the centre of shot and Clive Skilton posed with his Revolution 3 Top Fuel Dragster on the western side of Parliament Square. Unfortunately even Clive can't remember the name of the chap on the left! 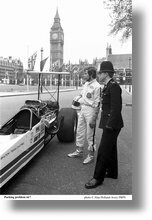 Just under a year before the above pictures were taken and Clive's ride was a very different car indeed. Second Revolution was the name and here it is getting a bit crossed up at the Pod. Those of us of a certain age who witnessed all this know that Clive Skilton's arch rival was Dennis Priddle. This is Dennis in the John Woolfe Racing Hot Wheels-sponsored rail and unless I am very much mistaken it looks as if Alan was using his motor drive for these two shots. 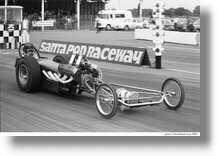 Staying with Top Fuel Dragsters for a moment, this is Tony Densham driving Santa Pod Raceway's very stylish Commuter slingshot. Note that the cowl has been extended back and up to form a windshield which Tony can only just see over. I imagine he must have had trouble getting in and out of the car. 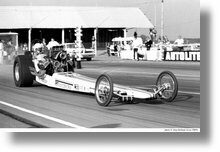 John Siggery leaving on the green in the injected Geronimo dragster. 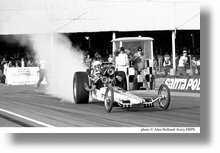 Is it a dragster or a competition altered? 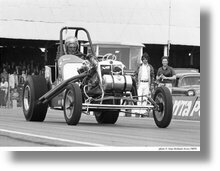 It is Cliff Jones and Mike Treutlein's Crescent Coupe which in 1970/71 was powered by a 302" injected Chevy small block. You can read an article on this car written by Mike Lintern by clicking here. 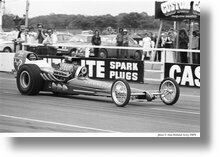 My thanks to Nick Pettitt for identifying this car as Ken Cooper's Bazooka II flathead dragster. 'King Harold' Bull launches his diminutive but incredibly fast 998cc BMC-powered Stripduster rail off the line. You can read more about this car on the Stripduster website. 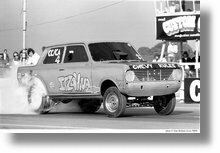 I am very pleased to report that Harold was inducted into the British Drag Racing Hall of Fame in 2010. Time for some competition altered action. 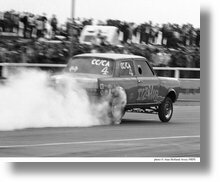 Here are a couple of good shots of the late Alan Wigmore trying his very best to fog out Santa Pod in his Itzaviva Chevrolet-powered Vauxhall Viva HA-bodied car. 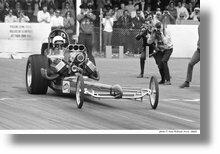 Kevin Pilling has his 'race face' on as he launches his 440 cubic inch Dodge-powered altered. 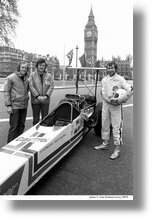 Once again, you can read an article on this car written by Mike Lintern by clicking here if you wish to learn more about Kevin and the car. 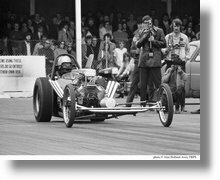 This is Ian Garbutt in his High Fever Fiat Topolino-bodied altered. The Page brothers' team went on to achieve great things but even they had to start somewhere. 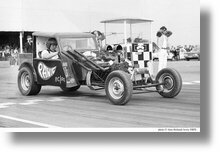 This is the late Dave Page driving the ex-Hustler originally built by Mark Stratton and now renamed Panic. Love those bare arms! It must have been a tad noisy judging by Chief Start Line Marshal Stu Bradbury's pose. 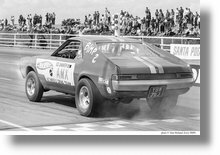 The late Ed Shaver drove this B Modified AMX and was part of the Hot Wheels Drag Racing Team. 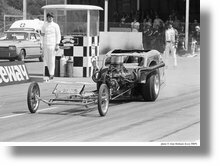 The car was powered by a 390 cubic inch V8 lump with a Carter 4bbl carb. Nick Pettitt to the rescue again, this is Chris White's TVR which he called The Screaming Blot. Answers on a postcard please if anyone knows the origin of that very singular name. 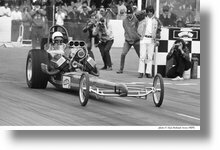 Move forward three months and Alan was back at Santa Pod to record this super shot of Dennis Priddle launching the Hot Wheels fueller with perhaps just a little bit too much clutch. Oh dear! 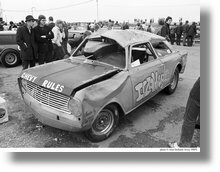 Disaster struck for Alan Wigmore at the August Bank Holiday meeting when he rolled Itzaviva at the top end and completely totalled the car. 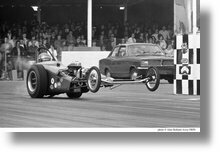 Fortunately Alan survived and carried on heading up the National Drag Racing Club with great success for many years.